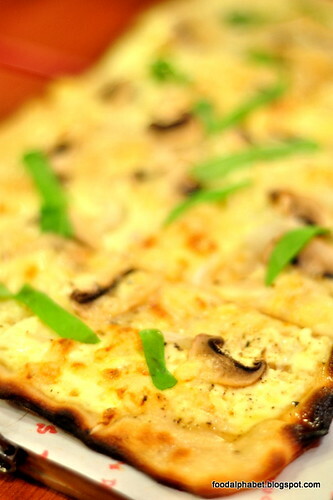 The Food Alphabet and More: Chuck's Deli new delights : Flatbread Pizzas! 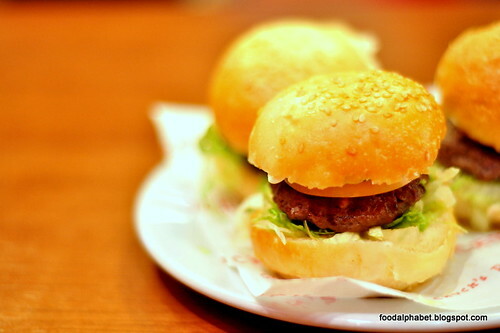 I have first encountered Chuck's Deli in January of 2011, it was on their Serendra branch and I just loved their slabwiches, from the Faking Duck, Reuben Slabwich, California Waki, they have definitely left a great impression on me. And of course, I'm dying for their home-made potato chips. And now after a year and a half, they have another branch in Eastwood, and another great addition to their mouthwatering menu, The Flatbread Pizzas. The pizza pictured above is cooked in a brick oven, made with white cream cheese and spreads of sausage and spices and what do we get? 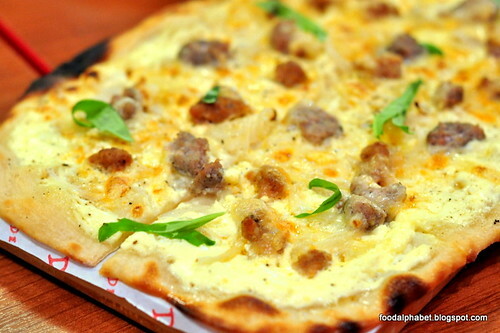 8 thin, deliciously, crisp flatbread pizza slices, the Sausage Flatbread Pizza (P265), And when I took first bite, it totally took my breath away. 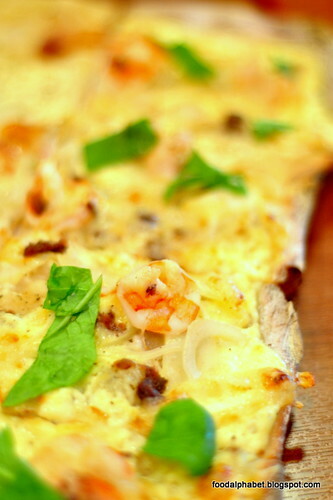 Other choices you can try are the Mushroom and Swiss Flatbread Pizza (P265, left) and Shrimps and Anchovies (P265, center), which is reminiscent of the "Friday's Special" from Shakey's which by far is still my favorite pizza flavor. 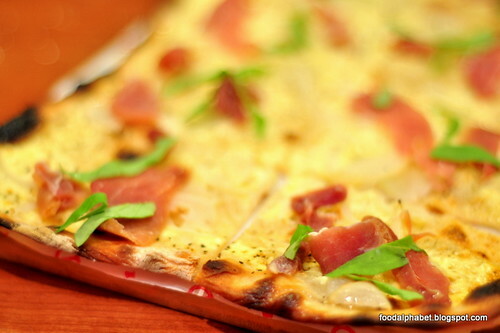 And on the right we have the Bacon Flatbread Pizza (P245, right), great choices wouldn't you think? 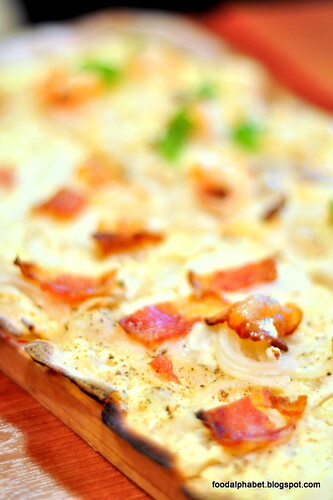 Another flatbread pizza to look out for, the Parma Ham (P285), with generous slices of parma ham on top of cream cheese, is probably one of the best tasting flatbread pizzas in town. Well if you have been craving for parma ham, then look no further, as this will definitely be your dream come true. 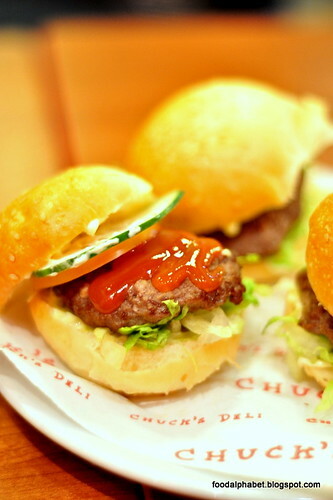 Check out Chuck Deli's other delicious offerings, taste their Angus sliders (P295), 3 miniature pcs. of Chuck's famous Angus burgers. 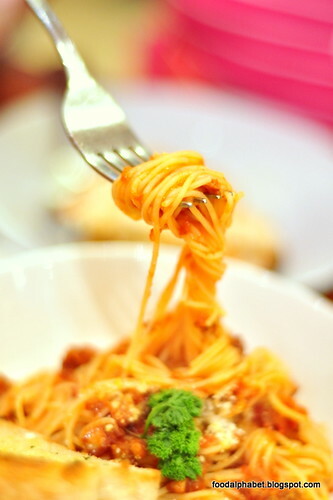 Take a bite as well on their Chucked Pomodoro (P295), angel hair pasta with chorizo-chucked pomodoro sauce. 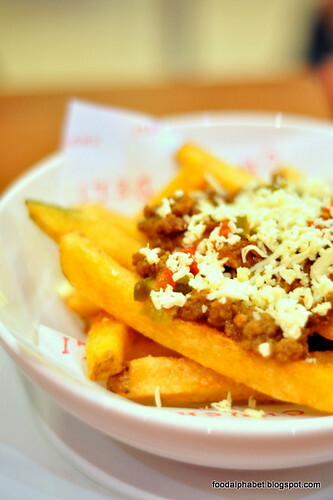 And if you're craving for fries, order the Chili fries (P195), and enjoy them to your heart's content, these home-made fries will definitely keep you coming back for more. 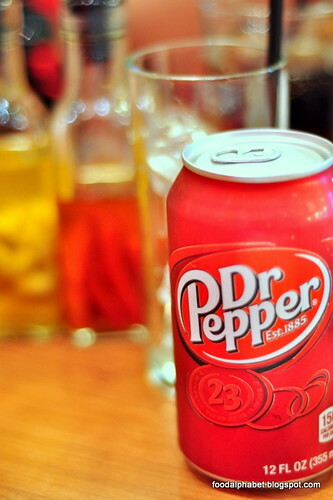 Take a sip at their delightful choices of refreshments, from imported sodas and other thirst-quenching drinks. Eat 'em up while they're hot! Visit Chuck's Deli and enjoy their flatbread pizzas and other delicious offerings. Get them from the makers of the best slabwiches in town, Chuck's Deli. Visit their branches at Serendra (02-576-4210) and Eastwood mall (02-900-0503). Wow! These flatbread pizzas look amazing! Thanks! Hey you're on my blog roll!